The opening ceremony of the AJA Forum 2008 is under way at the conference room of the Korea International Trade Association in Seoul, Korea, on October 7, 2008. The forum attracted about 60 journalists from 31 countries. The Asia Journalist Association held the AJA Forum 2008 and the 2008 AJA Plenary Session on October 7-10, 2008, in Seoul and provincial areas in Korea, drawing about 60 journalists from 31 countries. Under the theme "Climate Change: Media Catalyst in New Green Revolution," the AJA Forum 2008 took place on October 7 at the Korea International Trade Association (KITA) in southern Seoul. Among the dignitaries at the one-day forum were Kim Hyong O, speaker of the Korean National assembly; Goh Kun, former prime minister and chairman of the Climate Change Center in Korea; Great Britain's Jim Boumelha, president of the International Federation of Journalists; and Charles Morrison of the United States, president of the East-West Center. The AJA delegates adopted two resolutions during the four-day event: one on climate change and the other on the AJA's status. The participants in the 2008 AJA Plenary Session, which was held at the Baekdam Temple in Inje-gun, Gangwon Province on October 9, unanimously adopted a resolution on the AJA's status as an international organization based on individual membership of media professionals. The delegates also expressed their full support for and confidence in the AJA leadership headed by Sang-ki Lee of Korea. "The AJA has succeeded in reinventing itself as a professionally oriented Asia-wide association with a membership based on individual journalists and allied media practitioners," the resolution said. It continued to say, "These members who will subscribe to the new AJA Charter and principles will form AJA charters in their respective countries." "Today, the AJA has a new identity and a growing number of loyal members. We are now well-placed to concentrate on our membership, training and development activities and live up to our new vision and mission." AJA delegates, together with Jim Boumelha, president of the International Federation of Journalists, visited the YTN headquarters in downtown Seoul on October 8, 2008 to drum up the AJA's support for the television network's labor-management issue. In the morning of October 8, the AJA delegates visited the YTN headquarters in downtown Seoul, together with IFJ President Jim Boumelha, to drum up the AJA's support for the television network's labor-management issue. Then they traveled to Cherlwon, Gangwon Province, where they made a Demilitarized Zone tour before adopting a resolution on climate change. They resolved to sign an AJA Green Pledge in support of efforts to realize a carbon neutral and remove threats to peace and secutiry arising from global warming. They also called on governments to act urgently to implement international agreements on climate change, while resolving to step up efforts to raise awareness of global warming through telling the true story of climate change in the face of lobbyists to spin a different yarn. The delegates also resolved to highlight news and information that could serve as a Course 101 on Green Living, especially in reducing our own CO2 footprint and become "carbon neutral." They resolved to convince lawmakers to enact laws and policies that will increase energy efficiency and reduce carbon emissions, while calling on the AJA to award Green Planet prizes for excellent and exceptional media coverage of environment issues and incidents. After a "No NO2" performance, the AJA delegates moved to the Gangchon Resort near Chuncheon, Gangwon Province. 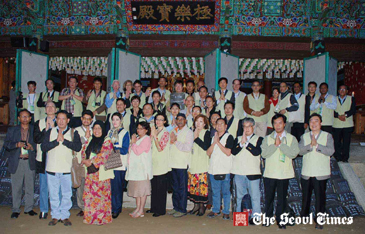 AJA delegates pose in front of the main hall of the Baekdam Temple in Inje-gun, Gangwon Province on October 9, 2008. The AJA held its 2008 Plenary Session at the temple. In the morning of October 10, there was a country report session for AJA members, in which about 20 delegates make their respective presentations on the climate change and media situation. In the afternoon, they traveled to the Baekdam Temple for the 2008 AJA Plenary Session and one-day temple stay. Among the participating countries and regions in the AJA Forum 2008 and the AJA Plenary Session were Bangladesh, Bhutan, Cambodia, China, Hong Kong, India, Indonesia, Iran, Japan, Kuwait, Malaysia, Mongolia, Myanmar, Nepal, Pakistan, the Philippines, Singapore, Sri Lanka, Taiwan, Thailand, the United Arab Emirates, and Vietnam. Also invited to the event were Canada, East Timor, Egypt, Russia, Mexico, Kazakhstan, Uzbekistan, and the Untied Kingdom. The AJA was created as the first Asia-wide regional journalist organization in November 2004 in Gyeongju, Korea by some 60 journalists from about 20 countries who attended the 2004 East Asia Journalists Forum. Participants unanimously selected Lee Sang-ki, then president of the Journalists Association of Korea, to serve as the new association's first president, and Seok-jae Kang, then chairman of the International Committee of the JAK, as its secretary general. On November 2, 2005, the AJA adopted its Charter and appointed two of its five vice presidents at its plenary session on Jeju Island. The two appointed were Ivan Lim Sin Chin of Singapore, a former president of the Confederation of the ASEAN Journalists (CAJ), and Seok-jae Kang of Korea, the first secretary general of the AJA. At the AJA Plenary Session on December 1, 2007, participants approved some amendments to the AJA Charter, which called for, among others, the introduction of AJA member national chapters. The new Charter allows wider membership of the AJA. 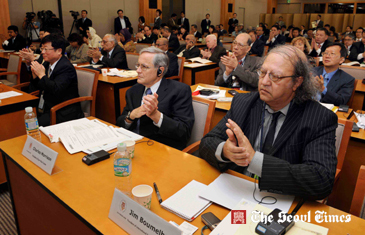 At the 2007 Plenary Session, three vice presidents were newly announced. They were China's Xu Bao Kang, then the Seoul Bureau chief of the People's Daily; Mongolia's Dolgor Chuluunbaatar, secretary general of the Confederation f Mongolian Journalists; and Malaysia's Norila Daud, president of the National Union of Journalists Malaysia. The plenary session approved the establishment of the AJA Journalists Safety and Solidarity Committee, which will be headed by Mr. Ivan Lim, with Indonesia's Eddy Suprapto, board member of the Alliance of Independent Journalists Indonesia, serving as vice chairman of the committee. The session also approved the establishment of the AJA Gender Committee, which will be chaired by Malaysia's Norila Daud. It also approved the launch of the AJA Development Fund, which will be chaired by the head of the AJA Board of Trustees. 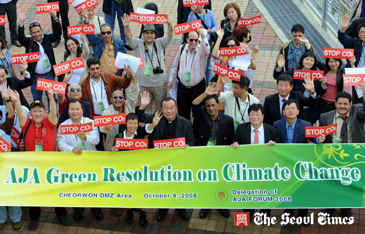 AJA delegates adopt a resolution on climate change when they made a Demilitarized Zone tour in Cherlwon, Gangwon Province on October 8, 2008. In the years that politicians and scientists passionately debated the causes and consequences of global warming or Climate Change, a politically correct term, journalists have weighed in. We are, of course, not talking of spin doctors here. Assuming the arbiter's mantle, we have deliberated critically on the conclusions and arguments advanced by both supporters and doubters of Climate Change. Our verdict is that global warming is indeed linked to man-made carbon emissions and is hurting people's livelihood in developing countries, blighting life-styles of those in developed ones and pose serious threats to peace and security to all. Unfortunately, international community has yet to put its act together. The clock is ticking away. We, the members of Asia media fraternity can now seize the moment to catalyse the world-wide efforts to fix Climate Change ills. — Convince lawmakers to enact laws and policies that will increase energy efficiency and reduce carbon emissions. — Call on AJA to award Green Planet prizes for excellent and exceptional media coverage of environment issues and incidents. AJA delegates exchange opinions on climate change and media situation during the AJA country report session at the Gangchon Resort near Chuncheon, Gangwon Province on October 9, 2008. It has come to the attention of the Asia Journalist Association (AJA) that some quarters have questioned the status of AJA, in particular its locus standi (local standing) as an international organization based on individual membership of media professionals in Asia. There should have not been any such doubts on the AJA. A careful reading and understanding of AJA founding principles would have cleared up any misunderstandings. More so, if those concerned have kept up with the AJA's evolution. 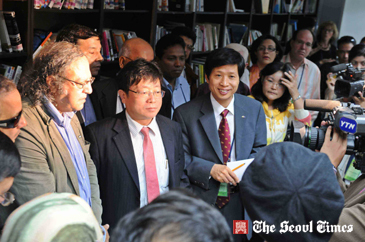 We came together as a loose grouping on the occasion of the 1st East Asia Journalists Forum in Seoul in 2003. Then we found a common interest and purpose to coalesce formally and establish ourselves as the Asia Journalist Association in November 2004. Our leadership has been drawn from core member organizations, including the Journalists Association of Korea, the National Union of Journalists Malaysia, the Confederation of Mongolian Journalists, the Environment Forum for Communicators of Singapore, the Federation of Nepali Journalists, the Alliance Journalists Indonesia and the Federation of Media Employees Trade Unions of Sri Lanka. 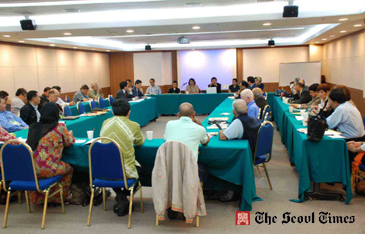 While the JAK played an eminent role in the AJA by virtue of its pioneering efforts in the East Asia Journalists Forum and by its helming the AJA through Lee Sang-ki, the JAK's former two-term president, the AJA's structure and status is international. Notwithstanding that the AJA's secretariat is based in Seoul and the Secretary General is appointed by President Lee. To their credit, Lee and his team have managed to keep the AJA in running order over the last four years. And then the AJA faced some turf conflicts not uncommon enough among mother associations with a brood of lively sibling national organizations. Another problem the AJA faced was the leadership changes arising from periodic elections among AJA member organisations. This would present us with a leadership continuity question in the AJA itself. It dawned on us that we could be better off and more effective reconfiguring the way we run the AJA. We have consulted and won wide approval from our partners for our new organization set-up and leadership structure, while retaining the original name, spirit and zeal of the Asia Journalist Association. The AJA would like to take this opportunity to announce to our delegates and guests as well as well-wishers that the AJA has succeeded in re-inventing itself as a professionally oriented Asia-wide association with a membership based on individual journalists and allied media practitioners. These members who will subscribe to the new AJA Charter and principles will form AJA chapters in their respective countries. AJA chapters have already been up and running in Korea, Bangladesh, Mongolia, Nepal and Singapore. Coming soon are the Philippines, Malaysia, Indonesia and Thailand. Today, the AJA has a new identity and a growing number of loyal members. We are now well-placed to concentrate on our membership, training and development activities and live up to our new vision and mission. In doing so, the AJA will keep growing our cooperation and friendship with fraternal media bodies and welcome them to our forums and annual conferences. At the 2008 AJA Plenary Session, which was held at the Baekdam Temple in Gangwon Province on October 9, 2008, AJA delegates unanimously adopted a resolution on the AJA's status based on individual membership of professionals from all the media sector. The delegates also expressed their full support for and confidence in the AJA leadership, headed by Sang-ki Lee of Korea. Mr. Kang Seok-Jae serves as a senior writer for The Seoul Times. He teaches as a part-time professor at his alma mater, the Graduate School of Interpretation and Translation at Hankuk University of Foreign Studies, and the Seoul University of Foreign Studies. Mr. Kang also serves as secretary general of the Asia Journalists Association and the Asia coordinator for the International Federation of Journalists.